Chicago poet, Martha Modena Vertreace-Doody was one of my luckiest finds at the National Federation of States Poetry Societies’ 2011 Annual Conference in Dearborn, Michigan over the weekend of June 16-20. I went there hoping to connect with living, breathing poets. Everyday I participate in a rich Facebook and Twitter writer community and while fun and informative in its own way, it’s not enough, or even real for that matter, and I am still very much engaged (more like consumed at the moment) in work that involves computers and software. . . not a lot of time to work on building a strong local writing community though I am trying to with the help of a few other local poets and especially with my friend, Julie Moore. Frankly, I miss being in the MFA program (2008-2010) at Ashland University where I was surrounded by amazing poets and writers. You end up being spoiled by that kind of literary fellowship. Beyond having to crawl out of the black hole of post-MFA trauma (a normal response, I’m told), I truly miss the inspiring exposure to my fellow students and to poets like Angie Estes, Peter Campion, Steve Haven, Katherine Winograd and so many others I was fortunate enough to come into contact with during my tenure at Ashland. For me, Vertreace-Doody’s poems possess what James Dickey coined, “presentational immediacy.” This is a term he picked up from his study of the work of philosopher, Alfred North Whitehead. In an interview with the New York Quarterly (Spring, 1972, No. 10, available in reprint), Dickey discusses presentational immediacy. JD: That’s a phrase of Whitehead’s. 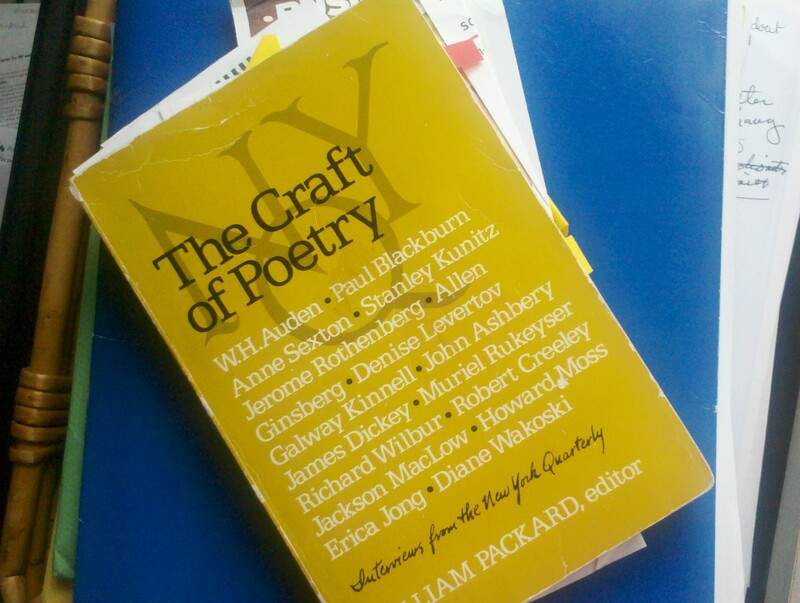 NYQ: Well, you describe it as a “compulsiveness in the presentation of the matter of the poem that would cause the reader to forget literary judgments entirely and simply experience.” Does this have to do with the oral presentation of the poem? Vertreace-Doody’s poetry achieves this presentational immediacy described by Dickey, drawing me into it, into a real experience of my own through the reading of it. I particularly like the line that begins: “Once at home, I know what to say/when all that’s left of summer/paints a fringe of hollyhocks along the highway.” From time to time, I find myself gasping slightly, (could this be an awakening of my sensibilities) as I often do when I read poetry that speaks to me in this way. I believe that happens when there is present, the “compulsiveness in the presentation of the matter of the poem that would cause the reader to forget literary judgments entirely and simply experience.” Poems throughout Vertreace-Doody’s book, Glacier Fire do this over and over. What Vertreace-Doody spoke of and read to us from at the NFSPS Convention is her current project which is a series of historical poems surrounding the life of Elizabeth Caldwell Duncan (1824-1876), the wife of Illinois’ first congressman, and later its governor, General Joseph Duncan. Ironically, Vertreace-Doody talks of being inspired to pursue the series after reading Recovering Ruth, a Biographer’s Tale, written by Robert Root, a creative non-fiction writer who also just happens to be a faculty member in AshlandUniversity’s MFA program. Vertreace-Doody said she was inspired by Root’s beautiful prose writing in addition to his attention to the historical detail. She read several poems from her new work (which I will promptly acquire although there are no specific dates or publishers as of yet. Vertreace-Doody does not seem to be in any hurry to leave this project, or perhaps more accurately to leave Duncan.). In a craft session, Vertreace-Doody walked us through the details of her exhaustive research over several years. She says she can actually feel Duncan’s presence at times having become so familiar with the most intimate information about her life although she is quick to add that she doesn’t even believe in such things. I am so grateful for having gotten to meet Martha Modena Vertreace-Doody and to hear her read and to have heard her share so passionately about this new work. It was inspiring and just what I needed to feed my hungry poet soul. This entry was posted in Uncategorized and tagged Ashland University, Ashland University MFA, Grace Curtis, Historical Poetry, James Dickey, Martha Modena Vertreace-Doody, New York Quarterly, Poetry, presentational immediacy, Robert Root. Bookmark the permalink.